The robe I am wearing, the clothes you are wearing – they have something in common. They have a seam. It is the place where two pieces of cloth meet and are stitched together. 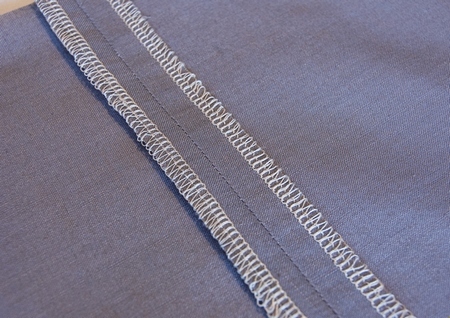 If it’s done well, the seam is even and strong and provides support to what rests on either side of it. It holds fast against stretching and pulling, against all kinds of stress on the material from the outside and from the person inside it. But the thing about a seam is that it is also a pressure point, sensitive to tearing and rending which makes it a precarious place to be. The chair in which you are sitting now has a seam where two pieces of metal meet and are welded together. The room that holds us has a seam where the roof meets the walls and sometimes this year the rain drips in. In so many ways we live on a seam. We observe these holidays on the seam of the year between summer and fall. On one side 95 degree days, on the other wind and rain and tornadoes. It is ironic that the New Year is celebrated as the natural cycle heads towards death. The darkness is increasing each day. The leaves are beginning to fall and the plants are starting to die off. It would have made more sense for the New Year to begin on the Seam of winter and spring when the light increases incrementally each day getting longer, and the natural world is being reborn all around us. Yet it is autumn with its impending end that most conveys the feeling of renewal. We are meant to feel today how precarious it is to live on the seam with so little holding it together. Yom Kippur is the holiday of the Seam. “On Rosh Hashanah it is written and on Yom Kippur it is sealed, who will live and who will die, who will be brought low and who will be raised up.” That is, as Unetane tokef begins, the sacred power of the day – profound and awe-inspiring. To live on a stitched together seam and understand that on one side lies tranquility and the other torment. If you have a young adult in your life, or you are a fan of young adult fiction, a genre that did not even exist when most of us were young adults, you may have noticed that the most popular young adult novels and movies have “The Seam” as a central location. The seam is generally a place on the border between two areas, it is dangerous but so exciting. It is where people cross back and forth as they figure out who they are becoming. That seam is in many ways true to the Jewish idea of liminality. How we travel back and forth across this seam and others is called living and it is ours to choose today. This too is contained in Unetane Tokef, some will travel across this seam peacefully and some will be troubled. But there are tools at our disposal upon which we may draw when we are faced with this uncertainty of living on an edge. We draw on ritual – the customs and traditions to which we hold fast and that are sacred to us. These may be rituals that are personal to us and only us, and they may be rituals that are a part of our family heritage. They may also be rituals that we experience in community. The family table about which we spoke on Erev Rosh Hashanah provides not only a place to tell your family story, but also a refuge from the seam. The ritual of the family meal brings us back to safe harbor after a day of uncertainty. Life cycle rituals, for example Bar and Bat Mitzvah provide a way to do what football coaches call “working the seam,” finding a way through from one side to the other. We draw on beliefs – those dogmas which guide and inform our lives and thus help us navigate across the seams when we come to them. Principles provide a way to do what seamstresses do, to know where to place the needle to create a strong, unified, long lasting fabric for our lives. Belief, no matter what it is or whether or not it includes a God figure, provides a moral compass that points the way when we come to a fork in the road. Indeed it is belief that lets us know when we’ve reached a boundary in the first place and guides us whether to cross it or not. We draw on community – those individuals who people our lives and let us know that we are not alone in the world. There is an epidemic of loneliness in this country, that no number of text messages or emails about kosher turkey seems to cure. Community ensures that we do not travel across the seam on our own. Community means that we will be heard, that we will be accompanied, that we will have a quiet presence sitting beside us offering comfort. Community is the tool, perhaps more than any other, which gives us the strength to navigate the seams of our year, our lives, and our world. Unetane tokef itself suggests three other tools to draw upon when faced with the uncertainty of living life on the edge – teshuvah, reflecting on the type of people we have become and the type of people we might aspire to be; tefilah, the rituals of prayer and Jewish life that provide a refuge and help us find a way through, and finally tzedakah, a awareness of and caring for community, joining human beings in the daily struggle of living and trying to make those lives bearable, easier, better. There is great power in the seams. A strong seam can be impervious to tearing. Scientifically that’s because it spreads the force across a long line instead of at points. Today we see the longer trajectory of our lives. And the seams don’t mar it, rather they strengthen it, give it character and meaning. Next week we will read from the book of Ecclesiastes and we will hear of all the different times of life. “A time to be born and a time to die, a time to laugh and a time to weep, a time to tear and a time to mend.” The Rabbis say that this last refers to death and mourning, a time to tear our garments in grief at the loss of a loved one, and a time to mend that tear when the days of mourning have past. The tradition says that for those who wish to do so, they may repair the tear so perfectly as to render the garment seamless even after mourning. Except when one loses a parent. Jewish law requires that even if one mends a tear that marked the loss of a mother or father it must be done in a way that leaves a seam. That seam gives voice to a life lived before and after profound loss and the way in which one is forever marked by that loss. Jewish tradition does not see seams as fault lines, always waiting dangerously to open up and swallow us whole. It sees them as stopping points, as thresholds, as opportunities. For most of the year we dance delicately, still and small back and forth across the lines. On Yom Kippur we feel more keenly that we are not dancing but hovering constantly. We are living on the seam and living on the seam forces us to hold a mirror to ourselves. In Jerusalem there is a unique place called the Museum on the Seam. It is an art museum located in a building that itself was once a seam. It started out as a private home but eventually became an army outpost in no man’s land – on the border between Israel and Jordan alongside the Mandelbaum Gate that connected the divided city of Jerusalem. It sees its geographical location as an opportunity. Because it exists on the seam, it takes the opportunity to raise questions about the intersection of war and peace, of Israel and the rest of the world, of religion and art. Its curator says that visiting the seam can give a person life inspiring experiences that improve the quality of their life. As we spend the hours of Yom Kippur on the seam of the year we hope that the same is true for us as well, that we are inspired to improve the quality of our lives and those around us.